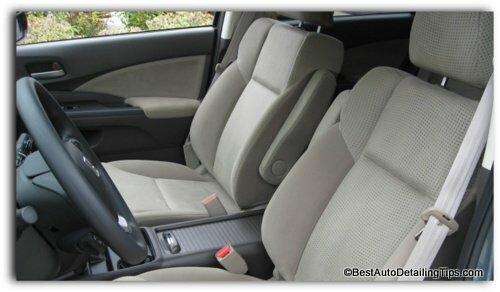 How to clean car upholstery: Easier than you have been told or think. Like many areas of car care and auto detailing, how to clean car upholstery is an area filled with so many different opinions and strategies that many people like yourself feel overwhelmed at the very thought. So day after day goes by and the only attention your car's upholstery ever gets in the best of circumstances is a quick vacuum job. But vacuuming your car's upholstery is only going to go so far in removing dirt that will accumulate within your car's interior. Eventually you will need to find some form of upholstery cleaner, get personal with the interior of your car, and do some scrubbing! Looking into the interior of any car will quickly reveal the endless materials, fabrics, and surfaces that make up any car interior. 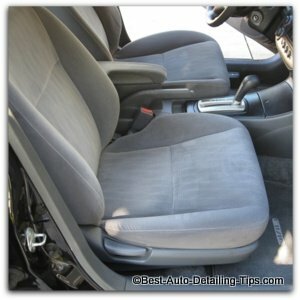 Upon first glance, how to clean car upholstery within your car is an overwhelming proposition for most people. Despite your immediate fears and anxiety, cleaning the inside of your car is far easier and simpler than your family, friends, and the neighborhood know-it-all has lead you to believe. 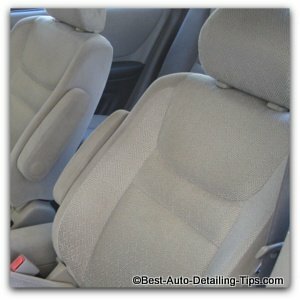 The industry itself would have you believe that how to clean car upholstery you would need about 10 different cleaners. One specialized cleaner after another. No hot water carpet extractors needed here. No high-pressure water systems needed. No complicated methods or overly specialized cleaning solutions. Plastic lined interiors; usually work trucks only. Allow me to explain: With any topic of life there are basic rules to understand and follow. I believe that it is best to first learn the rules, then you can learn to break the rules; and to every rule there are exceptions. Not all carpeting or upholstery is created equal; the tighter the weave, the more difficult it will be to clean. Some materials used on seating surfaces will never come completely clean if they are a very tight weave and have become excessively dirty. Carpeting or upholstery with no nap, or a closed loop weave like Berber carpeting, is very difficult to clean. Some entry-level (cheaply priced and cheaply made) cars have what is more like felt as carpeting than traditional carpeting; this type of "carpeting" is very difficult to not only vacuum, but shampoo. Due to the lack of separate fibers that stick up individually (like traditional carpeting), debris and dirt will embed and get stuck within these fibers, making it difficult to remove. The best way to describe this in a simplified manner is like trying to clean your dirty hand in the open position, with all your fingers representing individual fibers (nap), versus having your hand held in a fist with your fingers tightly closed and the dirt stuck in-between your fingers. No upholstery shampoo or cleaner has the ability to clean every form of dirt, and numerous factors will determine your overall results; eg. how long has the dirt been allowed to remain there, what is the composition of dirt, what type of fabric/cloth are you cleaning, the cleaners you have chosen. I merely inform and show you what I use professionally to get professional grade results. I always, always use a fabric protector after every shampooing/cleaning I do when it comes to cloth or fabrics of every kind. If you break down the various materials in this particular van from above (Chevy Astro Van), you can see how to clean car upholstery could get confusing, over-whelming, or complicated for many people. Seating made using both cloth and vinyl. People look at all these materials and think that each material is going to require its own special form of upholstery cleaner (and the manufacturers are more than happy to sell you a separate product for each form of material), when in fact a quality all-purpose cleaner does exist and can clean virtually everything in your car's interior. So the reality is that learning how to clean car upholstery is much more simple and straight-forward than you have probably thought. How to clean car upholstery actually has some good news in that it can be a much more simple process than many people believe or have come to accept. All-purpose cleaners exist that can replace many of the dedicated cleaners filling the shelves of your personal garage, or the shelves of the retail store all screaming at you to purchase. For example: dedicated car leather cleaners, general upholstery shampoos, carpet shampoos, etc. Using the "right" all-purpose cleaner along with some strategic tools will not only provide better results, but make the various upholstery cleaning jobs that much easier. Massive amounts of positive ratings. One of my top picks for a car upholstery cleaner. Concentrate so you only pay for the actual cleaners; more economical. Combines a super biodegradable degreaser with enzymatic odor eliminator. No ammonia, bleach, or fabric damaging detergents or solvents. A super versatile car upholstery cleaner safe for virtually every material in your car including car leather. No sticky residue. No rinsing necessary. One of my professional choice in car upholstery cleaners. From shampooing to all-purpose cleaning of your car's interior. This is a concentrate and will take you a long way. Smaller container will save on any shipping costs using link above. No sticky residue; no rinsing necessary. As I mentioned above, you might realize that you will need limited amounts of upholstery cleaners and the ready to use versions will be a better fit for you. It also allows you to "test" a particular product without over-committing to bigger sizes. For the car enthusiast or driveway detailer looking for the convenience of a ready-to-use car interior cleaner. Safe for use on all interior materials. Carpeting, velour, leather, vinyl, rubber. Ultima Interior Shampoo & Cleaner Gel for Interior Finishes on Auto, Truck, RV, 22 fl. oz. Another quality ready-to-use carpet cleaner that is suitable for use on all your interior cleaning and shampooing. Perfect size for the enthusiast or driveway detailer. "How to clean car upholstery is not just about finding the best car upholstery cleaner, but using the perfect tool to achieve professional results"
Rubbermaid Commercial Products - Rubbermaid Commercial - Iron-Shaped Handle Scrub Brush, 6" Brush, Yellow Plastic Handle/Blue Bristles - Sold As 1 Each - Molded handle gives you a powerful grip. - Long-lasting blue polypropylene fill resists stains. - Durable plastic block. This is my first choice in an all-purpose scrub brush I use on all fabric in the easy to reach ares of car upholstery cleaning: floor mats, leather seats, fabric seats, some headliners, trunk carpeting, etc. Occasionally the cheaper tool can be the better tool. Another one of my "go-to" scrub brush for virtually any car interior cleaning. The winning balance between too soft and too stiff. The hand held version is lower profile so you can scrub into areas that are a tighter area. Mothers Carpet & Upholstery Brush z,/pz. Stiffer than the others on this page. Ideal for carpeting and floor mats. This is a very stiff brush so I reserve this for the heavy duty scrubbing and the more "durable" materials within your cars interior. Winning balance between gentle and aggressive. I use on anything from carpeting, velour, leather, vinyl, suede. Handle allows for increased leverage when using. Use the handle in the traditional manner, or switch it around for a more ergonomic feel with your palm on the brush head and the handle pointed up, towards your elbow. A must have in my opinion as a professional. If you have watched my YouTube videos and seen me use this, mine has black bristles instead of white; it is the same brush. This is the exact bottle brush I use in my professional world. More aggressive or stiff than the OXO brush below. Since I use this on hard plastics and fabric within cars, I prefer the much stiffer version. Amazing how many hard to reach areas these bottle brushes are ideal for: in-between car seats and center console, trunk carpeting to break loose dry debris, inside cup holders and side compartments, etc. Amazing how many uses I can find for a tool that typically has nothing to do with detailing a car! Incredibly versatile tool! You will continue to find more and more uses for it the more you use it. From shampooing hard to reach carpeting, to seat hardware, to breaking loose trapped debris in the trunk carpeting as I am vacuuming. Any "how to clean car upholstery" must have this amazing tool as part of the "must have" cleaning tools. Winning combination of gentle and aggressive. Handle allows for greater leverage when using in tighter areas. The longer handle is also ideal for those tighter areas where a traditional length tooth brush or other cleaning brush will not reach. Ideal for more detailed areas of cleaning. Safe for use on any interior material from leather, carpeting, velour, suede, etc. Ideal for detailing/cleaning the tight area between the accent piping and seat cushion found on many of the car seats within many cars. A detail brush I consider a must have. Ideal for very tight areas of cleaning. Stiff bristles make this a better alternative to traditional tooth-brush type detail brushes. Dual sized bristles make this detail brush very versatile. I prefer this boars hair detail brush when I am using any chosen car upholstery cleaner to use wet rather than the other boars hair detail brushes that I keep dry. Boars hair is incredibly soft and gentle and only becomes even softer when the hairs become wet. I use this when I have to use a cleaner that is going to be required to break loose debris and dirt when detailing intricate parts within the cars interior. A must have in my professional detail arsenal. A must have for dusting your dash vents. Ideal set; reserve one for dry and one for getting wet (with one as a back-up) with cleaning solution. Use on vents, cup holders, or any intricate parts of the cars interior. Boars hair is a very soft bristle. Vacuum any and all areas first! Very important, as the more dry and loose debris/dirt you can remove before getting any area wet, the better. Simply spray the pre-vacuumed area with cleaner, scrub with brush aggressively, mop up by hand using a micro-fiber cloth (my preferred cloth of choice). Light applications, repeated as often as necessary for desird results is far better and far more realistic than to think you are going to get it all in one, heavily saturated application. As a professional, I will have to repeat heavily soiled areas anywhere from 3-6 times based on amount of dirt and material I am cleaning. Despite what you have learned in regards to how to clean car upholstery, using a quality car shampoo will not make your car's upholstery or floor mats now suddenly attract dirt. Many manufacturers will disparage their competitors products by claiming to be free from sticky residue or cleaners that attract dirt; simply follow my lead and you will be fine. With that said, you need to remain realistic and understand that once your carpeting/cloth/fabric/floor mat s have been cleaned, they will still have the ability to get dirty yet again; shampooing them is not a one time only moment and I always recommend a fabric protector after every shampooing. "Darren, you've just shown me how to clean the fabric and carpeting of my cars interior, but what about the rest of my cars materials that aren't fabric or carpeting"
Within every part of the car detailing and cleaning process, the ripple effect is always at play. Meaning this; cleaning the fabric and carpeting areas of your car is one thing, but the very next question for most people will be "How to clean the vinyl, leather, and plastic within my car. For this reason I have added these extra links for dedicated pages for these specific questions. 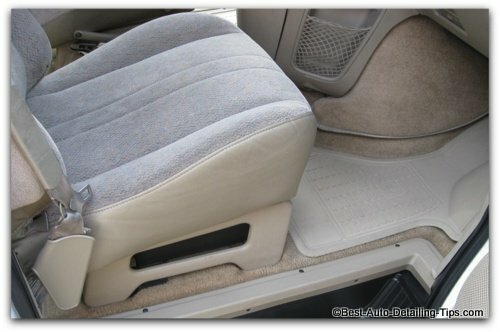 Cleaning and shampooing the carpeting/floor mats in your car will be easier than the actual seats in your car. As a rule, most cars contain actual carpeting with individual fibers that is used to cover the floors and used as floor mats in cars. In contrast, car manufacturers use many different types of materials and textures to create the seating surfaces within cars today. These seating surfaces will prove to be much more difficult if you car has been made using these modern, tightly woven, synthetic materials. These seats may look cool, but trying to get them clean can be especially frustrating. It is important to know that any professional detailer with any amount of experience will confirm this. Some seating materials are simply unable to be cleaned back to original condition due to the way in which they are made and the materials being used to construct these new, hip looking interiors. Seat belts are one such example and represent a problem for any professional detailer. 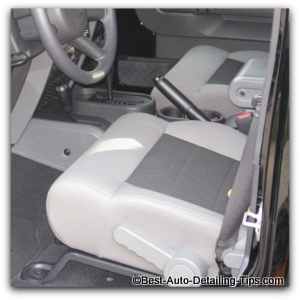 Below are a few examples based on the type of seating you may find in your car's interior. "This shot is taken from a Honda Civic and represents what I call "typical" cloth seating in a car; not overly thick, not specifically tight woven either." "This picture is from a Toyota Highlander and represents what I call medium weave; tighter than the Honda from above with less nap or fibers protruding above the base material itself. Represents a harder proposition of cleaning with less individual fibers actually exposed to the cleaning process." "This shot is taken from the infamous Jeep Wrangler. I say infamous as any professional detailer will tell you, these types of synthetic, tight woven seats are a nightmare to clean. My professional advice is to never let them get dirty in the first place. Repeated applications will be required to produce any significant results especially on this light colored material." All I can say is that much time and effort went into this page and I hope I have laid out enough information for you to get the kind of results I get in my professional world. Don't forget to pass this page along to any of your friends who might benefit from all the info on this how to clean car upholstery page.